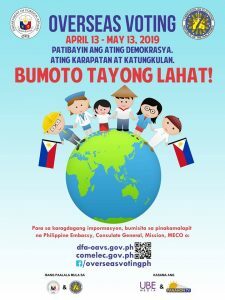 The Philippine Commission on Elections (COMELEC), pursuant to Resolution No. 10498, has provided the guidelines for the accreditation of mass media in connection with the conduct of overseas voting for the 2019 National Elections. Endorsement from the newspaper, television, radio station or internet news agency employing the applicant. The period for the filing of accreditation is from 15 February 2019 to 31 March 2019.